Originally posted Feb 23, 2011 and updated January 22, 2013 with more info. People like Alex Jones and Ron Paul, while claiming to offer an alternative to American corruption, are strangely silent when it comes to the agency that is historically most culpable. While ostensibly defending our Constitution; they say nothing of the organization that has opposedit the longest. “None of these self-styled ‘freedom fighting’ conspiracy theorists expose the real power behind all the conspiracies at work,” writes Seventh-day Adventist layworker, Roland Temple. The American patriot and one of my heroes, William Cooper, didn’t like Alex Jones and exposed his Y2K fear mongering tactics on one of his shortwave radio broadcasts. I believe William Cooper was a sincere truth teller who paid the price for his faithful broadcasting of truth with martyrdom. 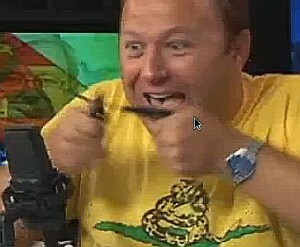 How many times has Alex Jones been persecuted and beat up to the point of being hospitalized? William Cooper was. The Youtube clip below shows Alex Jones rudely disrupting a peaceful rally lead by an American patriot proclaiming the same message Jones himself claims to hold! Please see http://www.christianmediaresearch.com/jones.html for details. Some of my friends who listen to Alex Jones, and who knew political reality from decades ago, seem to actually believe that Ron Paul, if elected U.S. President, could turn around the negative foreign and domestic policies America has had since close to the beginning of the 20th century and improve the well being of the American people. With all the true information they had 30 years ago, I do think they should know better! No one man can turn around that country, not even with the help of all his friends. The enemy has infiltrated far too deeply. If Paul even came close to winning in a presidential campaign, I would smell a rat. Paul would need massive support of the Mass Media and Elite to be a viable contender for the presidency. And if he won, would he actually fulfill his present vision for the country? If he tried, he would suffer the same fate as JFK did in no time. An excellent resource I found is Who is Alex Jones? AJ’s duty is to serve his masters by conducting occult magick, in order to create the illusion of truth. By what seems to be endless amounts of bones to uncover, the people have been thrust into a frenzied mentality of let’s see what AJ has for us tonight. As if they are dope feigns looking for their next hit and at the end of the day, what difference has it really meant in the grand scheme of things. They often end right back at ground zero, only to repeat the routine over and over like a rat running on a treadmill. Alex Jones talks about Al-queda as a creation of the CIA as if it is an actual network of terrorists. It is not. Al-qaeda is a creation of the CIA, but created only as a fantasy only in the minds of the public! Al-queda doesn’t exist! I think Mr. Jone$ may have ulterior intere$t$. I suppose there is a lot of ca$h to be got by $preading di$information. Am I a pessimist in my overall worldview? I am very optimistic of the future, but only when the King returns. US Government’s Secret Army: Foreign Troops to be Deployed After Martial Law is Declared .. By Susanne Posel.